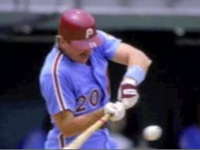 Mike Schmidt was known for his unusual way of standing. Oh, sure, he also had impressive numbers and hit the ball out of the park, but it was not just his slugging percentage or his home run abilities that made pitchers fear him. No, it was his rather strange way of standing at the plate that really caused them fits. Schmidt accomplished a rare thing even during the times in which he played. He played his entire career with the Philadelphia Phillies. In 1972 the team traded away third baseman Don Mooney to open a slot for the hot prospect out of Ohio University. Schmidt, in turn, returned the favor by hitting 18 home runs. However, he ended the season only batting .196 and had 136 strikeouts. Things improved the very next year and his batting average rose to .282. He also earned his first trip to the All Star game that same year. He also showed just how much power he could have at the plate, particularly during a game on June 10 when he hit a baseball into a public address system suspended 117 above the stadium floor and 329 feet from home plate. The ball then fell to the field and, since it was in the Houston Astrodome, it was still considered in play. It held Schmidt to only a single, but the signal had been set. Schmidt’s biggest year would come in 1980. It would also be the only time he would make it into the World Series. 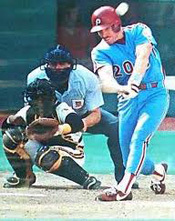 He had 48 home runs that season and helped the Phillies get into the postseason. It would also earn him the National League MVP. Most importantly, he would help the Phillies charge through the playoffs and then into the World Series and come away with a World Series championship. By the time Schmidt retired, in 1989, his stats went on forever. He was World Series MVP in 1980. He was also a 12-time All Star and eight-time National League home run champion. He was a 10-time Gold Glove winner, he played third base. He was a six-time Silver Slugger winner and a three-time National League MVP. He even hit four home runs in one game, on April 17, 1976. Ultimately, he had a career batting average of .267. He also had 548 home runs total to earn him membership in the 500 Home Run Club. He also notched 1,595 Runs Batted In.